The Nativity Story describes the historical events surrounding the birth of Jesus, and it is one of the most beautiful stories in the Bible. It tells how the God of Heaven, working through everyday people, sent His Son to earth to be made fully human in every way. He was born as a typical baby boy in the small town of Bethlehem. The story has always captivated my attention, and I have studied it for many years. It is far more involved than most think and the actual biblical account provides some surprising differences from the holiday postcard version. 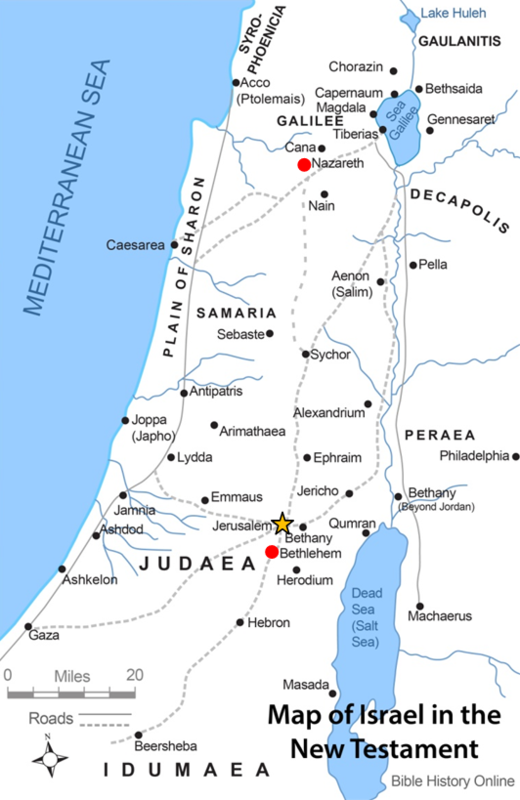 Before we begin, let us look at some maps of Israel at the time of Jesus’ birth. They will help us understand how many of the events worked together. They will also help us to realize how Zacharias and Elizabeth may have been far more involved than first thought. The first map shows all of Israel, with Nazareth in the area of Galilee in the north, and Jerusalem in Judea (Judah) toward the south. Depending on the path taken, Nazareth was 75 miles (through Samaria) or 97 miles (along the Jordan river through Jericho) from Jerusalem. The trip would have taken four to seven days, depending on the route and mode of travel. Travel throughout the Roman Empire was reasonably safe, and the Roman roads were excellent for their day. 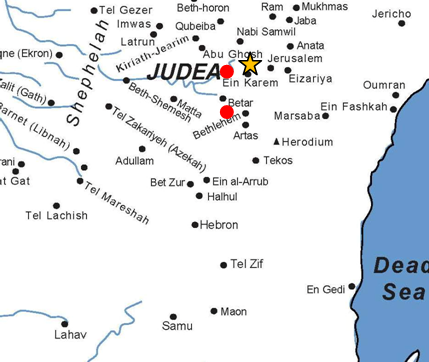 The map also shows how close Bethlehem is to Jerusalem. It was only five and a half miles away and could be walked in several hours. The second map is an enlargement of the Judean hill country west of Jerusalem. Again you see Bethlehem, but now you can see another little town just north of it called Ein Karem. This is the traditional home of Zacharias and Elizabeth, and the birthplace of John the Baptist. Ein Karem is only four miles from Jerusalem and only five miles from Bethlehem. This location would make it convenient for Zacharias and Elizabeth to support Mary and Joseph. Only Matthew and Luke mention the birth of Christ, and each tells different aspects of the story. However, when you study them chronologically, they fit together perfectly. Matthew relates Joseph’s side and Luke relates Mary’s side. I have included scriptures from both Gospels in chronological order. When describing the events and story line, I have tried to be very clear on those things directly referenced in scripture and those things which I have added to fill in the implied account. I have also included timeline information, showing how each event relates to the time of Christ’s birth. All of the events, beginning with Zacharias in the temple, and ending with Mary and Joseph coming back from Egypt, are related by timed intervals revealed in scripture. Now let’s start the greatest story ever told. Zacharias and Elizabeth were an elderly couple living in a small rural town about four miles west of Jerusalem called Ein Karem. This area was referred to as the Judean hill country. They are both prominent people, Zacharias is a priest and Elizabeth is a descendant of Aaron. However, she is childless and well past the age of bearing a child. 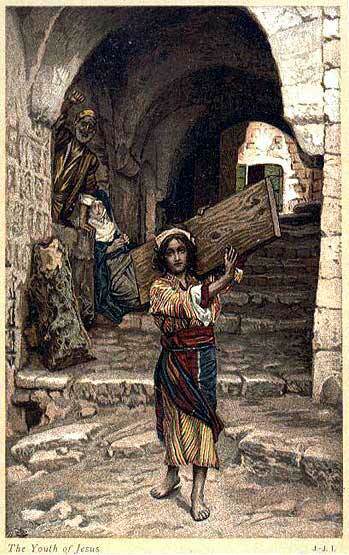 In Jewish culture, childless women carried a mark of disgrace. They assumed it was caused by God withholding His blessing. Both of them are about to have a miraculous encounter with God. Approximately 15 months before the birth of Christ, probably in late May to early June, Zacharias was selected for a once in a lifetime opportunity to enter the temple of the Lord and burn incense. During his time alone in the temple, the archangel Gabriel appears to him and tells him that Elizabeth will conceive a son and his name is to be called John. Zacharias, however, does not respond very well, and Gabriel commands that he be struck mute and unable to speak until John is born. He states that it done because “(Zacharias) did not believe my words.” This inability to speak will be a reminder to Joseph that God is doing something big and that He will fulfill His promise. After his service in the temple is complete Zacharias goes home and communicates to Elizabeth what happened in the temple and that she is now able to conceive and bear a child. How exactly he does this, we do not know. Women in that day were unable to read and communicating such things to a woman through another man was unthinkable. In any case, he was successful, and Elizabeth conceives. So amazed is she that she hides it for five months before telling anyone. In Nazareth of Galilee, lived a young virgin named Mary. She was probably 12 to 14 years old. She is engaged to a young man named Joseph, who was probably 14 to 18 years old. Both are descendants of King David. 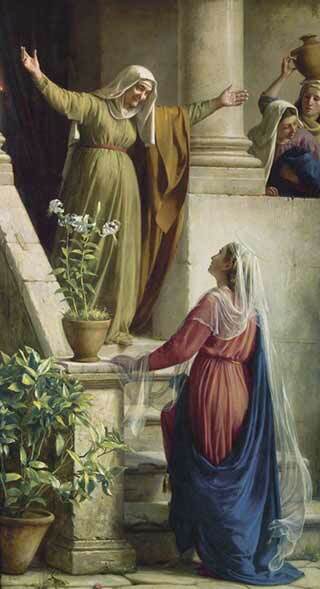 Six months after Elizabeth conceives, the same angel Gabriel appears to Mary as she is going about her daily chores. He tells her that as a virgin she will conceive a child by the Holy Spirit and his name is to be called Jesus. He goes on to say that this Jesus will be called the Son of the Most High God. She is, of course, amazed by this, but she receives the word from Gabriel in faith. The angel Gabriel then goes on to tell Mary that a relative of hers, named Elizabeth, probably a Great-aunt, has also conceived a son through supernatural help from God. The implication is that God wants Mary to go to Elizabeth and that He wants these two women to get together. It is unknown whether Mary travels the three or four days needed to get there alone or if someone, maybe her mother, traveled with her. Both are possible. As soon as Mary arrives and greets Elizabeth, the baby in Elizabeth’s womb leaps and she prophesies about Mary’s pregnancy. 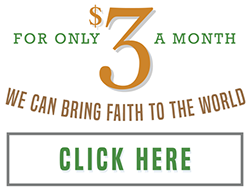 All this happens before Mary has a chance to utter a word about her miraculous conception. This word by Elizabeth is a confirmation to Mary, and to any family member that may have traveled with her, that God is doing this. Then Mary begins to prophesize about her condition and the Child that is now in her womb. This word is yet another confirmation to them all that God is doing this. Being with Zacharias and Elizabeth becomes her safe place. It was Gabriel that appeared to both of them. They are the only people in the world who know that God is doing this. Now, Mary, Zacharias, and Elizabeth start to compare notes and discuss her situation. Zacharias cannot speak, but somehow he must be able to communicate with them. He is a priest, and he knows the scriptures by heart. He knows that according to Micah 5:2, the Messiah is to be born in Bethlehem, only five miles away from their home. They now have three months till John is born to figure out a plan. Mary, Zacharias, and Elizabeth know that there are two things necessary for their plan to succeed. One, Mary must give birth in Bethlehem, and two, Joseph has to be convinced that this is God’s will and that he is still needs to marry her. 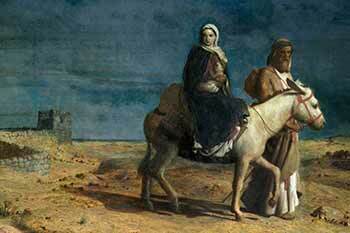 There is no other way; Mary must travel back to Nazareth and meet with Joseph. She, or God, must convince him that this is of God. There is one problem. Even though Mary is only three and a half months pregnant, she must be starting to show. We know this because she decides to leave Zacharias and Elizabeth before John is born. She apparently cannot take the chance of being found out when the priests, the neighbors, and their family show up for the birth. She must travel back to Nazareth trusting that God will do something to give her favor with Joseph, and hide her condition from everyone else in the village. She must somehow persuade Joseph to marry her, and not tell anyone else. She needs for Joseph to come back with her to Zacharias and Elizabeth’s house. If her family does not know, then they too must be convinced. This is crunch time for Mary. It must have been a long walk back to Nazareth. After Mary leaves, Elizabeth gives birth to John. The birth of John is an important event. Zacharias was a priest, and Elizabeth was a daughter of Aaron. She was old and barren, but now she is giving birth. And because of the incident in the temple, all the priests know about the miracle. Friends, neighbors, priests, and family will all be there. Now the time had come for Elizabeth to give birth and she gave birth to a son. Her neighbors and her relatives heard that the Lord had displayed His great mercy toward her; and they were rejoicing with her. Immediately after Zacharia writes down his approval to name the boy John, his voice returns. He then is moved upon by the Holy Spirit and begins to prophesize over him. Meanwhile, in Nazareth, Mary meets privately with Joseph. However, the meeting does not go well because Joseph does not believe her. His life is now shaken and leaves to go figure out what he is going to do next. Both of their lives now seem to have fallen apart. Fortunately, he has not yet told anyone of her situation. He is a righteous man, but he does not want to disgrace her and her family. He is considering sending her away secretly. This is an important point because if Joseph were able to send her away ‘secretly,’ that would confirm to us that nobody else in Nazareth knew that she is pregnant. If they knew, then sending her off secretly would no longer be an option. While Joseph is considering what to do, an angel of the Lord visits him in a dream and tells him that the pregnancy is by the Holy Spirit. He is told to marry her but that he should keep her a virgin until the child is born. He agrees, but they do not marry in Nazareth, that would be too dangerous. They’ll wait and let Zacharias the priest do that for them. No one ever finds out about the pregnancy. They only learn about it decades later when the Gospel of Matthew is published. We know this because if anybody even suspected that Jesus was conceived outside of a proper marriage, they would have thrown it in His face when He started His ministry in Nazareth (see Mark 6:3 and John 6:42). They also would have surely brought it up at His so-called trial in Jerusalem, at the Crucifixion. There is much contention about the historical accuracy of this census. The confusion lies in not knowing that Quirinius was Governor two times, once at this time and again later. Joseph and Mary leave Nazareth for Judea. It is now about five or six months before she is due to give birth. They have plenty of time to stop off at Zacharias and Elizabeth’s house to figure out what to do next. This would be a perfect time for Joseph to hear firsthand from Zacharias all that God is doing, and perhaps for him to marry them. 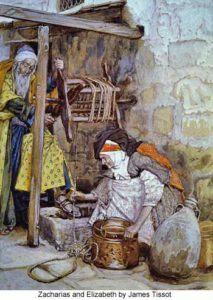 When they left Nazareth, they were not yet married, as the scripture still referred to Mary as being ‘engaged’ to Joseph. There is no mention in the scriptures of when they are married, but Joseph is called the ‘husband’ of Mary in Matthew 1:16, 19. This reference was a description from the future time when the Gospel of Matthew was written, so we know that at some point they were married. The census was their reason to be in Bethlehem. Scholars differ on whether Mary had to register in the census being a woman, but it is clear that she went. The Romans were very efficient administrators, and Caesar Augustus even more so. They would have allowed a window of at least four to six months for people to register for a census. There would be no reason for them to be in Bethlehem on that specific date unless they wanted to be there at that time. If Zacharias encountered Gabriel in the temple in late May to early June, then carrying the timeline up to the birth of Jesus would give a birth date around the middle of September. Because of this, many have proposed a date of September 14 or 15 for the birth of Jesus. If that were true, He then would have been born on the first day of the Feast of Tabernacles. And His circumcision then would have been on The Eighth Day of Assembly, which is an important day directly after the seventh and last day of the Feast of Tabernacles. When the time arrives for the birth, they made sure that they were in Bethlehem. They probably left Zacharias and Elizabeth’s house in plenty of time to find a suitable place to stay and give birth. There is nothing in the scriptures to prevent Zacharias and Elizabeth from accompanying them. They probably thought there would be no problem getting a place to stay, but with the Feast of Tabernacles going on that proved wrong. They had to settle for a cave or a barn-like shelter, and afterward, they would lay the newborn Jesus in a feeding trough to sleep. Jesus was probably born during the day because later that night God chose to first announce the glorious birth of the Son of God to lowly shepherds watching temple flocks in the nearby hills. 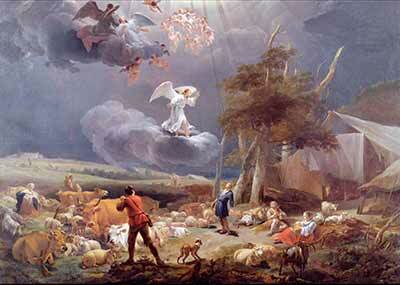 There is more text is allotted to the shepherds than to the visit of the Magi – 13 verses in all. As soon as Mary could travel, they go back to Zacharias and Elizabeth’s house. On the eighth day, baby Jesus is circumcised and officially given His name just like John three months before. Joseph and Mary, probably with Zacharias and Elizabeth, travel the five miles to the temple in Jerusalem to fulfill the requirements of the law of Moses. Women had to go through purification 40 days after the birth of a male child and 80 days after the birth of a female child. They were apparently poor because they could not afford a lamb sacrifice. Their offering cost about $2.5. Jesus is the real Lamb sacrifice. While they are in the temple, they are approached by a devout man who has been fervently waiting for the birth of the Messiah. The Holy Spirit is mentioned three times in reference to him. 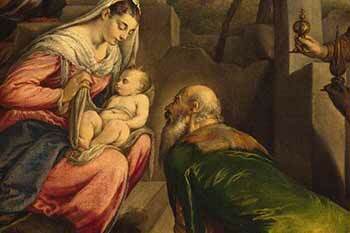 As soon as Simeon sees the child, he knows that his prayers and the promise God had given him have been fulfilled. His amazing prophecy covers the fullness of the Gospel and the work of Christ. Then a prophetess comes forward. She has been serving in the temple day and night for decades waiting for this very day. After all the requirements of the Law are fulfilled, they finally leave Jerusalem for their home back in Nazareth, perhaps after a short stay with Zacharias and Elizabeth. This will have been eight months since Joseph had been in Nazareth, and over eleven months since Mary had been publicly seen in Nazareth. Notice the first words in this scripture reference – “Now after Jesus was born…” The Magi were never at the birth of Jesus. Sorry, holiday postcards. But how long after the birth did they arrive? We don’t actually know. We are only told that Herod gave the order to kill children ‘two years old and under,’ which would indicate an estimated time of between three months to one year. We know that it could not have happened within the first 50 days, and we will find out later that the Magi visit had to occur on the very last day before their urgent escape to Egypt. Magi coming to Jerusalem and talking about the birth of a messiah king was a huge deal and sparked much interest by all those living in the City, most of all Herod the King. There was much speculation at the time about the coming Messiah; men’s hearts and all of creation knew that something was coming soon. We don’t know where the Magi came from or who exactly they were. Most think they came from Persia and were from a group of which Daniel was a member centuries before. Another option is the Kingdom of Sheba, in modern day Yemen. There was an ongoing relationship between Sheba and Israel at the time, and the gifts presented all had strong ties to that kingdom. There are also several scripture references that may refer to this – Psalm 72:10, Isaiah 60:6, and Matthew 12:42. There is much conjecture on the true meaning of the star and what it was. I won’t say much about it, except that I believe it had to have a supernatural element to it. Matthew recounted only what was publicly known about the Magi’s meeting with King Herod but was not privy to the later secret discussion and the actual date of the star. God hid this for some eternal reason. We will know someday. Everyone knew that Bethlehem was the place of the Messiah’s birth. And of course, so did Zacharias. Herod sends them to Bethlehem, but where they went, we do not know. Again, they all knew that the Messiah was to be born in Bethlehem, but this was probably nine months after the birth. They assumed that his family was from Bethlehem and would still be there. The text only says that “they (Magi) went their way,” and that the star led them to the place where Jesus was. The star could have led them to Bethlehem, or Nazareth, or any other place. However, we do know that during this time Joseph, Mary, and the ‘child’ were said to be living back in Nazareth. The Magi find the ‘child’ Jesus now living in a house, not a temporary dwelling like that in Bethlehem. The Magi and their impressive caravan must have created a grand public spectacle in the quiet village of Nazareth. Everybody knew whose house they visited. The gifts presented were costly and would soon provide the funds necessary for travel to Egypt, their living expenses until Herod dies, their trip home, and finally a new home and maybe even a construction business back in Nazareth. It does not take long for Herod to find out that the Magi did not go to Bethlehem, a mere five and a half miles away. 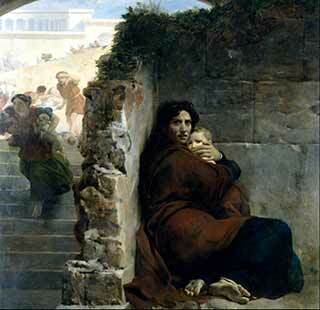 Once Herod is alerted, he is enraged and immediately sends his troops to murder all children under two years of age. The ‘vicinity’ mentioned could not have been too large, or else Jerusalem would have been included. Apparently, Zacharias, Elizabeth, and John were safe five miles away in Ein Karem. And of course, Jesus was safely living in Nazareth 80 miles to the north. But Joseph, Mary, and the child Jesus won’t be safe for long. Herod’s troops would soon be following the trail of the Magi straight to their house in Nazareth. The Magi were probably only a few days ahead of Herod’s troops when they arrived in Nazareth. It does not say how long they stayed, but they couldn’t have stayed longer than a day or two. That very night after they leave an angel of the Lord awakens Joseph and urgently tells him to get out of bed and flee immediately to Egypt. It had to be close. Herod’s men were coming, and it would be easy to find which family home the Magi visited. The angel tells Joseph that they are searching for the child. Depending on where the Magi originated from, they would have traveled either directly north through Damascus, or east and then south along the King’s Highway that runs east of Jerusalem. Joseph would probably have gone to the nearby Roman city of Sepphoris to get lost in the crowds and then travel west to the coast. From there they could have gone south along the coastal trading route to Egypt. Herod’s men would be coming up from Jerusalem directly from the south. Only God could have orchestrated this. Joseph, Mary, and Jesus probably hid in the great city of Alexandria in Egypt, a distance of about 400 miles. It was a wealthy city, academic, and had a population that was about 30% Jewish. A great place for a young child to start life, and they had enough money to live well. Several short years later, Joseph receives the angelic announcement that Herod is dead. It is now safe to return to Israel. It appears that Herod’s search for the child was a lengthy endeavor. This is the first time Nazareth is mentioned in the Gospel of Matthew., and it sounds like they didn’t want to go back to live there. There has been disagreement on whether Joseph was only from Nazareth or that he might have had other family location options. Or maybe the thought of going back to Mary’s hometown would be too risky. There could be lingering suspicions about the timing of their marriage and the birth of Jesus. In any case, they return to Nazareth and raise Jesus. Nazareth was a small town of 400 to 1,600 people, but it was only four miles from the Roman city of Sepphoris, a regional capital and a major center of commerce. It would have plenty of construction work to keep a new carpenter/builder busy. 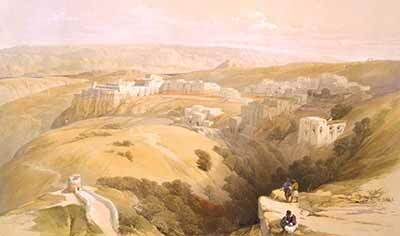 Nazareth was also close to one of the important trade routes, so it had access to many cultures. The tension starts – the legal guardian stepfather conflicting with the Heavenly (birth) Father. Even Jesus had to become a teenager. Imagine being the stepfather after five frantic days (two on the road and three in Jerusalem) of searching for your son, only to find Him and He matter-of-factly tells you that you should have known all along where He would be – in “My Father’s House.” I think I would have had a hard time with that. Jesus was raised in what we would refer to today as a blended family, which was rare in those days. He had a birth mother, a stepfather, four stepbrothers, and at least two stepsisters (Mark 6:3). He had to look and act like a typical boy, except without sin. What does that look like? His own family did not realize or believe that He was the Son of God until after His ressurection. He is obedient to his mother and stepfather, and He grows up in Nazareth. This is the last we hear about His childhood and the last of His earthly father, Joseph. We know that by the time the story starts up again, Joseph is gone. This concludes the birth story of Jesus Christ, the Savior of the World. 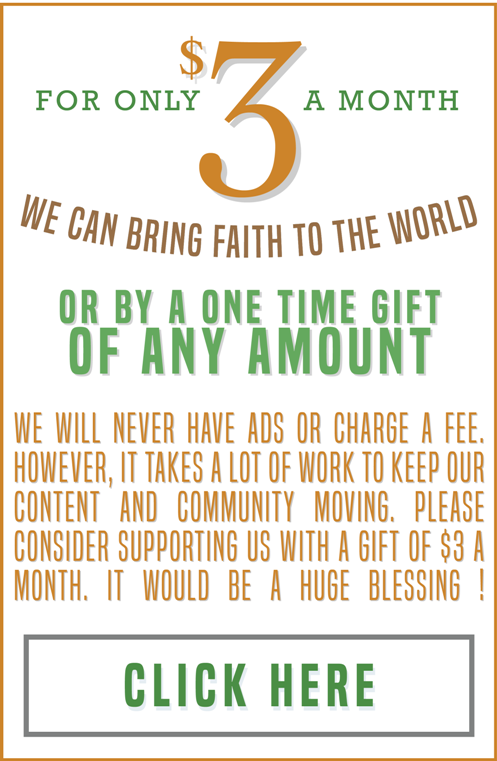 The next time He is mentioned, He is starting His earthly ministry around the age of thirty. We will live with Him forever! Thanks for a well researched article on the Nativity truths. However, there is no basis in Scripture that Zacharias conducted the wedding for Joseph and Mary. Yes, indeed, the wise men from the east worshipped the Child Yeshua. God bless you. Look forward to meeting you in Heaven with Our King. Beautifully told, with your customary insight and wisdom. Thank you for putting this together, it must have taken you forever! Hope you & your family had a wonderful Christmas. Beautifully illustrated and effectively retold. Rex, .. great job putting this all together! !